30th Annual “Sight First” Hole In One Shoot-out September 14 – 16th. 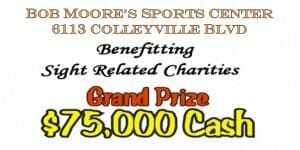 This annual charity event is held at Bob Moore’s Sports Center located at 6113 Colleyville Blvd. Last year’s “Sight First” Charity Hole In One Golf Shoot-out was a huge success due to the great weather bringing out over 300 avid golfers for our 3 day event. We had one hole-in-one in our preliminaries and 9 finalists trying to win the Grand Prize. We received very positive feedback from our contestants as to their enjoyment of the fun, friendliness and organization of our event. We raised over 10,000 dollars for the charities we support. As a Sponsor you can play a huge part in making a difference to the adults and children, that our sight related charities support. Your support also helps many families in our community that are in need. We at the Colleyville Lions Club thank you for the help you have given the community and us. As a valued sponsor you also receive significant benefit from our event publicity. Our sponsors know that their contributions are generating excellent advertising return for them. We trust we can look forward to your support of our 2018 30th Annual Sight First – Hole In One Shoot-out.